Carol Holst, the founder and co-director of the nonprofit group Simple Living America, knows a lot about change. She calls herself a "triple empty nester." Almost overnight, Carol went from living most people's notion of the American Dream—booming business, nice house, successful husband, two gifted daughters—to living alone in a one-bedroom apartment in Glendale, California. And guess what? Carol says she's happier and freer living a scaled-down, simpler life. A self-described social entrepreneur, Carol is trying to make a difference by devoting her life to creating a national nonprofit organization, Simple Living America. Simple Living America is the first national nonprofit membership organization whose goal is to promote voluntary simplicity for the mainstream. It challenges the notions that consumption is always good and more is always better. Simple Living America is part of Cornell University’s CRESP (Center for Religion, Ethics, and Social Policy) Center for Transformative Action. In tandem with the PBS series Simple Living with Wanda Urbanska, Simple Living America seeks, in the words of its Web site, to "enhance quality of life through environmental stewardship, thoughtful consumption, community involvement, and financial responsibility." In addition to leading Simple Living America, Carol serves on the advisory board of Simple Living with Wanda Urbanska and on the Sierra Club’s national Sustainable Consumption Committee. Carol's most recent project has taken her into the realm of book publishing, where she participated in a minor miracle—the creation and publication of a book in 9 months. Carol had inherited some money and wanted to use it to build national awareness for Simple Living America. She looked for the most effective way to bring in grassroots support and decided to hold a national contest for the best short essays on the satisfaction of simple living. The writers of the 20 finest essays would receive a cash prize and inclusion of their work in an anthology. 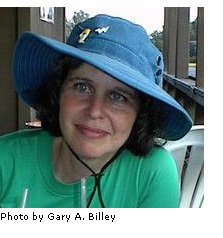 By the end of February 2007, Carol had received 400 exceptionally well written pieces. A volunteer editorial committee of theologians, teachers, and businesspeople then selected the winning 20 contributors. In accordance with contest criteria, the essays had to be eloquent and on-topic. Tone was also important. The committee sought the voice of "everyman" (or “everywoman”). Essays that seemed preachy, self-righteous, or elitist were not included in the book. The anthology, Get Satisfied: How Twenty People Like You Found the Satisfaction of Enough, was published in October 2007 by Easton Studio Press. Recently, I spoke to Carol by phone about the simplicity movement and Simple Living America. EN: Tell me about yourself and how you discovered simplicity. CH: I was not myself for 20 years of marriage. I grew up in Madison, Wisconsin. My parents were agnostics. Instead of stressing religious values, they stressed the value of serving others. I've always been deeply concerned with human survival issues, but while I was married I buried my concerns and focused on raising my two daughters. My degree is in early childhood education, and from my experience in trying to find a preschool for my children, I became concerned with the fact that children ages 2 to 6 do not get quality care in many preschools. In conventional preschools, the teacher-child ratio is 12 to 1. Even 6 to 1 may be inadequate for children of this age. So I set out to create a preschool that would be different, that would give young children the enrichment they need and that would also inoculate them against mindless consumption. I founded The Learning Place Preschool in Glendale, California, in 1981. I used my early childhood education career to provide a community service while nurturing my own children, and I really wasn't involved in or actually thinking about human sustainability issues at this time (other than an abiding interest in the welfare of all children). The Learning Place took off like wildfire. At any given time there would be 100 families on the waiting list. Young Children Journal, the flagship magazine of the National Association for the Education of Young Children (NAEYC), ran a feature article about my work. Then, when my children were approaching high-school age, my husband, a successful corporate executive, decided to end the marriage. For the past 10 years, I haven't had to focus on parenting or being a wife. I'm totally independent and able to devote myself 24/7 to human survival issues. EN: What are your daughters doing now and what do they make of your commitment to voluntary simplicity? CH: My daughters have very different values. They are both highly successful and fairly materialistic, but we deeply respect each other’s viewpoints. We also share a special bond as co-birthday girls because they were born 5 years apart on my birthday, October 8. EN: Please describe the origin of Simple Living America. CH: After the end of my marriage in 1989, I woke up to the peace, justice, and environmental crises of our world that jeopardize the future of humanity and realized that I had been given my freedom to try to help. So many crucial issues to focus attention on! But I eventually settled on the issue of global population growth, mostly because I wrote successful grant proposals in this field. Part of our population grants were geared toward strengthening the voices of people of color at the 1994 U.N. Conference on Population and Development in Cairo, so I quickly learned that a justice-centered approach to population issues is key. I realized that the most justice-centered thing I could do about global population growth is to work on the other side of the coin: the side spoiled by the industrialized world—that is, my world—with its focus on overconsumption. Since I didn't want to start another new organization (too much work, my kids were growing up fast and needed me, my dad's health was deteriorating), I tried to volunteer for other organizations that are helping to solve the American consumption dilemma and was turned down. So I researched and found a vital thread in this cluster of issues that had no national nonprofit membership organization for the general public to represent it: voluntary simplicity, also called simple living. I founded Seeds of Simplicity under the auspices of the CRESP Center for Transformative Action at Cornell University in 1996. In 2005, Seeds of Simplicity became Simple Living America to celebrate the partnership with the Simple Living with Wanda Urbanska national public television series. EN: What benefit does voluntary simplicity bring to ordinary people? CH: One of the beauties of voluntary simplicity is that it helps to broaden the field of philanthropy. It teaches us to practice simplicity because it enriches our lives, not because we have been made to feel guilty. It awakens the rich to the priorities in life that come from true satisfaction. As people's lives grow more stressed and more frantic, there is a greater need to take stock of our lives and discard the things that weigh us down. Some people feel that they are drowning in stuff and our society keeps pressuring them to pile on even more. Currently, we work a great deal with mental health professionals and are often focused on the public health benefits of voluntary simplicity. Our Web site is getsatisfied.org and our new book is Get Satisfied: How Twenty People Like You Found the Satisfaction of Enough. Now that my daughters are grown and traveling the fast lanes of the world in high-powered careers, I give loving time to SLA volunteer work at 1-877-Unstuff and more than fill the empty nest. Liz Milner is a freelance writer who recently moved to the Philadelphia area from Washington, DC. She contributed the essay "More is Less: Confessions of a Clutter Queen" to Simple Living America's anthology, "Get Satisfied." Liz is the founder of the Twentieth Century Recreation Society and a regular contributor to The Green Man Review . In her past life, she publicized events for Fairfax County and Alexandria, Virginia. Her best job was as a project coordinator for National Public Radio, her strangest job was inventorying animal parts invoices for a pharmaceuticals company. She cannot claim to have an empty nest, but she does have a very cluttered one. You can learn more by visiting her Web site at lizmilner.com.